The Who Wants To Be A Millionaire competition (WWTBAM) gameshow is one of the UK’s most popular TV exports. Millionaire was first aired on ITV in September 1998 and was an instant success with contestants and viewers alike. It now runs in many countries all over the world, with cash prizes that make the winner a “millionaire” if they make it to the end of the game. Who Wants To Be A Millionaire re-launched on ITV with Jeremy Clarkson replacing Chris Tarrant as quiz master. Beyond television, Millionaire has went on to become a popular brand with a board game, video game and many instant prize style game (both on online casino style games and a bars, nightclubs and venues over the UK where people can play to win an instant cash prize using a touch-screen games machine). We post all the best UK TV competitions with direct links to the itv.com entry from, questions and answers (incase you miss them!). Below you can find the most recent Who Wants To Be A Millionaire competition questions and answers. As you can see, the fun, games and big cash prizes are not only for the contestants on the show, ITVs Millionaire also offer a massive cash prize in their viewer competition which you can enter from the comfort of your sofa. The competition takes the same format as the TV competition with viewers being given a question and 4 multiple-choice answers to choose from…the questions are easy, although you don’t get a 50:50! Entry to to the Millionaire competition is fairly standard across all ITV competitions. You submit your answer (A,B,C or D) via telephone, sms or online. Telephone calls and sms messages will cost over £1, however entry to the competition using the online entry form via itv.com competitions is completely free. It’s sometimes a little tricky to find, which is why we post it on this site! The other thing many people (especially those who enter online at itv.com) do not know is that you are entitled to multiple entries to many itv competitions, sometimes as many as six! The number varies from show to show and we recommend you check the T&Cs, however in general you can enter the Who Wants To Be A Millionaire competition 3 times per phone number (we post the information alongside the competition everytime it is announced). If you enter via telephone or sms you are encouraged to enter again (costing you more money) but when you enter online itv do not tell you this little secret! 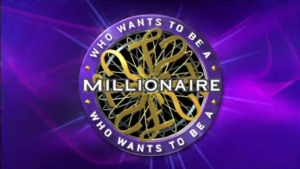 Unlike many other gameshows, on Millionaire, only one contestant plays at a time and they are given the question before having to decide if they wish to answer it or not. Each question they answer earns them more money and the stakes get higher as the show progresses…the cash prize doubles (approximately) for every question. Contestants also reach safety nets, whereby they pass a point (£1,000 and £32,000) and are guaranteed a cash prize…they also have three lifelines to help them get the anser correct “ask the audience” “phone a friend” and “50:50”. Each lifeline can only be used once during their play, however they can use all three at once. You may think this makes the game very easy but you would be surprised how many contestants fail and how few actual winners there are (most people take home a cash prize, but very few become an itv Millionaire!). First ITV promo of Who Wants To Be A Millionaire! 2012 – How Millionaire has evolved! The big UK TV scandal in 2003 was when contestant Charles Ingram, his wife and a college lecturer friend were convicted of fraudulently winning the WWTBAM show. All three were in the “fastest finger first” session and present in the audience while Charles was on the hot seat. Suspicious coughing at key moments throughout the show were brought to the attention of the authorities and all three contestants were convicted. A TV documentary was made and Benylin cough medicine went on to advertise during the commercial break! 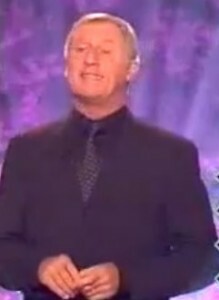 Chris Tarrant has played an important part in the development ans success of Millionaire, being the presenter through its entire run in the UK. His “is that your final answer” catchphrase, along with frequent advertising breaks at crucial points throughout the show, adds tension to the game and has been used, with minor variations, across the globe. Much of Who Wants To Be A Millionaire’s success can be attributed to the personality he brings to every show. 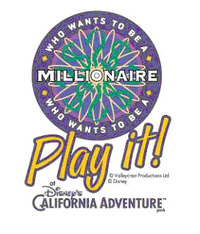 Such a success, Millionaire even has its ow attraction ad Disney World!